What’s an empty beer can worth? And why did the town council spend $850,000 – a grant from the NT Government – on a glass crusher which can process the town’s annual requirement in four days, while rejecting an option costing a quarter of that? The container deposit saga goes on. Back to the value of a can. As scrap it is 1c. To the manufacturer now obliged to pay a container deposit levy: 20c. To the consumer who redeems it at the container deposit depot: 10c. To the depot doing most of the recycling work: The Alice Springs one is looking for 6.6c but are not getting it as yet. Anything below that, they say, would see them out of pocket. To the coordinators of the process: 3.4c – or more. The last two numbers are the subject of an escalating argument: They must add up to 10c which is what’s left of the 20c funding the scheme after the guy dropping in the can to the depot has been paid. The argument is about how much the depot should get. In Adelaide it’s 5c average. But the Alice operator, Stewart Pritchard, of Territory Recycling Depot, says in Adelaide only eight separations are required, whereas in Alice there are three times as many. Of course that’s taking much more time, and anyway, operating costs are higher in The Alice. Containers redeemed at the depot must be divided up into eight categories (in Adelaide) or 24 (in Alice Springs), and be put into as many different bags or boxes. What’s more, each and every container must be individually recorded. For example, there are four different categories for aluminium cans, nine for glass (brown, clear and green, respectively, for three different manufacturers); liquid paper board (LPB) times two; plastic times five, steel cans and containers of opaque plastic (HDPE), times two. 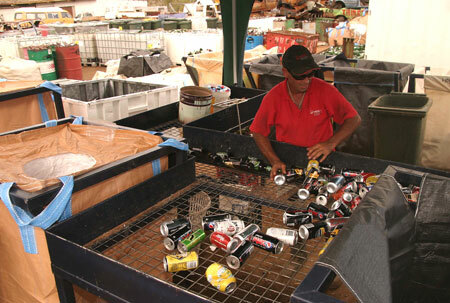 Having meticulously separated all that, which requires five full time staff in Alice Springs, the containers are taken interstate where – for recycling – all aluminium cans are put into one heap, and so are all glass containers and all plastic ones, and all liquid paper board and all steel. So what’s the point of having laboriously separated all this stuff in the first place? It’s so we know which manufacturer has got to pay how many lots of 20s to fund the new scheme mandated by the NT Government. Is there not an easier way to find that out? And then we could go down to one aluminium, three glass colours, one LPB, one HDPE and plastic bottles, one steel cans – eight separations instead of 24. The money saved by cutting down the number of separations could be used to raise the fee paid to people dropping the containers to the depot, and keeping Alice Springs beautiful. Also a bit of a puzzle is what’s happening, now that the council is getting out of recycling, to the glass crusher it bought and set up for $850,000 (the machine itself cost $450,000). It “will remain an important component of council’s facilities at the landfill, particularly with the upcoming redevelopment. This facility will play a vital role in council’s future recycling strategy,” a council spokesman told us last week. Mr Pritchard estimates that his depot will collect six tonnes of glass a week, or 312 tonnes a year. The council’s crusher can put through eight to 10 tonnes an hour. That means the town’s yearly crushing requirement can be met in 34 hours which is a little more than four eight-hour working days. And remember, the town council isn’t in the glass recycling business any more, at least not the kind glass for which deposits apply. From Saturday the council will accept glass but not pay for it. Crushed glass can be used in concrete for footpaths. An agreement to use the town council crusher could not be reached: the asking price of $98 per tonne was not acceptable to the coordinator of the container deposit program. Mr Pritchard has obtained a crusher from an allied company, Veolia, whose cost he estimates at $10,000. That’s one-eightieth of the cost of the council crusher. This is all the more bizarre when considering an offer to the town council by Andy Lines, of North Concrete, for a joint venture. He installed a crusher capable of 45 tonnes an hour, processing not just glass but rocks, old concrete from demolitions, and so on. The deal he suggested, talking to Mayor Damien Ryan and a council officer in several conversations, was to share the cost of the machine, with the council paying around $200,000 instead of getting its own for four time that cost. Mr Lines’ offer was not accepted by the council. But council CEO Rex Mooney says: “There was just one brief phone call to the Mayor that was referred on to the Director of Technical Services. “On hearing the details of the request, the Director deemed the machinery not suitable for Council’s purposes and therefore declined the suggestion. None of this stopped Minister for Central Australia Karl Hampton from gushing, at the launch of the council’s machine in June 2010, as reported by the ABC: “This is the largest glass crusher in regional Australia, what we have here in Alice Springs,” he said. “This will put Alice Springs well and truly on the map of being a place that is innovative, is looking at ways we can recycle our waste. This crushing story may very well put Alice Springs on the map, but for all the wrong reasons. NT Environment Minister Karl Hampton says the NT Government gave the funding to the council to pay for the glass crusher “for use in their recycling efforts at the time when they were running their voluntary cash for containers scheme. “The crusher belongs to [the council and any questions about its “use and plans should be directed to them. Meanwhile the beverage manufacturer Lion Nathon issued a media release firmly rejecting allegations of profiteering in implementing the the NT government’s container deposit scheme. The statement says: “While suppliers such as Lion have no role in determining shelf prices, we have consistently said that the container deposit scheme would force us to increase wholesale prices to reflect its costs and it’s clear this has led to NT consumers paying more for their beverages. “This is something Lion has been open about from the start and we have made an absolute guarantee that we will pass on no more than the scheme costs over time. “It would be far more constructive for the architects of this scheme to focus on fixing the problems they have created, rather than criticising suppliers for trying to manage the implications of their expensive and poorly designed scheme. “Lion’s prices have risen to reflect the 10c per container deposit fee plus system costs that must be covered. “These include the costs of establishing collection infrastructure, labour, freight and collections from both central and remote NT communities. Collection and processing costs in the NT are significantly higher than in SA for a range of geographic and system design reasons. “The handling fee applied already takes into account potential unredeemed deposits and is at the lower end of the potential spectrum of administration costs associated with the scheme. Meanwhile the Department of Natural Resources, Environment, The Arts and Sport claims scheme has had “a positive start with about three million containers already processed” and people would now get “recyclable green piggy banks as a further reward for bringing in empty containers. “Cashing in your containers can add up to a lot of dollars and what better place to keep your money than a green piggy bank,” the department says. PHOTOS: The “largest glass crusher in regional Australia” (top, courtesy Town Council) and Kym Schiller sorting empties into no less than 24 categories (above left). The Minister for Central Australia says “crushing glass will put Alice Springs well and truly on the map of being a place that is innovative”, and “is looking at ways we can recycle our waste”. Damien Ryan, the Mayor of Alice, is on record as naming the future role of the town’s tip as one of his core objectives while he serves as Mayor. There is another way we in Alice can be innovative at the tip. We could expand the green waste program to include the production of bio-char. I have no idea what that would cost, but perhaps not so much more than the purchase of the glass crusher and the placing of it under that industrial-strength roof. I think the Shire of Byron Bay has started a bio-char program at its tip. They would probably respond to a Council-to-Council request for information. We are an innovative town with good creds in the environment sector. We are a Solar City, we have a Water Smart program, there’s glass crushing and the mulching of green waste. Why not go one step further and branch out into the manufacture of another value-added green waste product, or bio-char? The company probably is named in the ASTC meeting / committee minutes, agenda papers (all on the website) or better still ask ASTC directly. The town council should name the local company it employed to build the open shed in the picture.